Passau is a historic city in Germany, on the border with Austria, and lies on the confluence of three rivers: the Danube, Inn and Ilz. Often called the ‘City of the Three Rivers’, Passau’s strategic location (map) was recognised since ancient Roman times (2nd century BC) when the first settlements were founded. 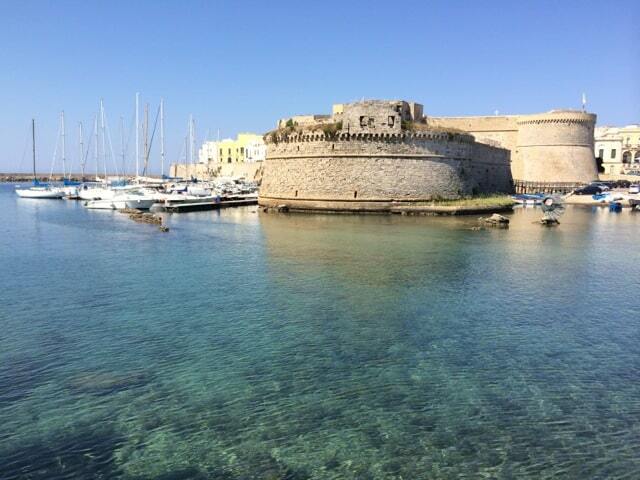 It remained a Roman town for more than 400 years and was later ruled by Bishops. Passau was the largest diocese of the Holy Roman Empire for several centuries, during which time it also flourished as a trading centre, where salt became the most important commodity. During the Renaissance period, Passau became famous for its sword-making. In the 17th century, a devastating fire destroyed the town and it was rebuilt in Baroque style. These days, there are many things to see in Passau such as the majestic St. Stephen’s Cathedral, thanks to its rich historical and cultural heritage. Passau is a pretty compact town so it’s easy to explore the town on foot. The biggest attraction in the town is without doubt the impressive St. Stephen’s Cathedral. This Italian Baroque masterpiece should not be missed as it’s literally breathtaking! The Cathedral is also home to the world’s second-largest pipe organ (with 17,774 pipes!) which you can listen to during one of the regular concerts. The exterior and magnificent interior of St. Stephen’s Cathedral in Passau. Another must-see in Passau is the New Bishop’s Residence (not to be confused with the Old Bishop’s Residence which sits atop a hill outside the town centre) which is situated behind the Cathedral. 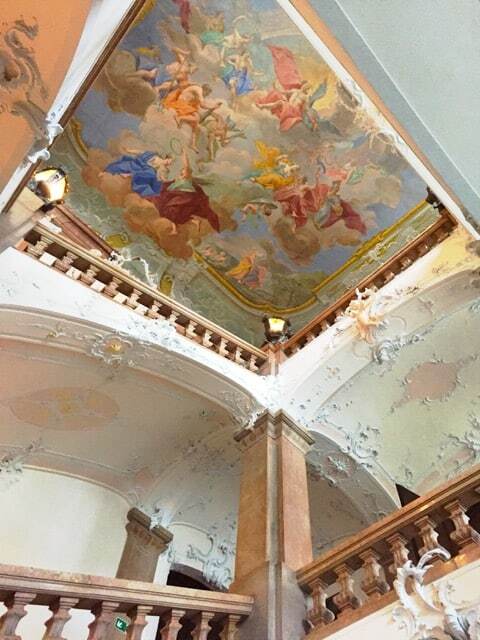 This Bishop’s palace was built in the early-18th century and has an impressive rococo staircase and beautiful frescoes. The frescoes at the New Bishops Residence. 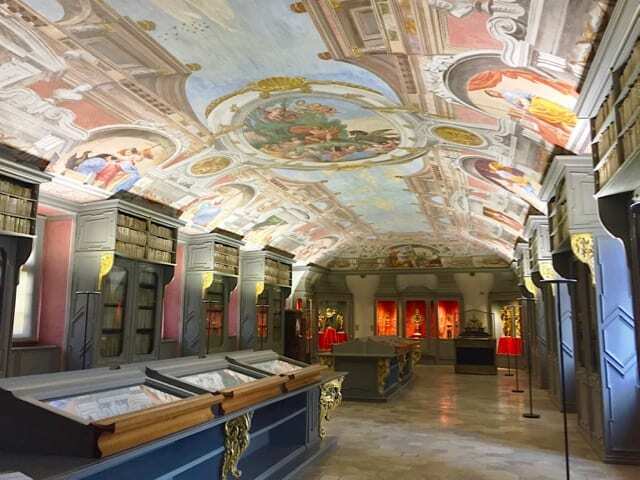 Visit the library on the first floor where a lot of treasures of Passau’s religious past are displayed. A young Wolfgang Amadeus Mozart once performed a solo concert in this hall for the prince bishop! The 13th century Veste Oberhaus fortress sits atop a hill on the other side of the Danube River from the Old Town. Long the residence of the Bishop of Passau, the Veste Oberhaus now houses an interesting museum, restaurant and open-air theatre. The Veste Oberhaus as seen from the bridge acroos the Danube. The Altes Rathaus is a striking Gothic building that faces the Danube River. The big hall features grand paintings by Ferdinand Wagner depicting scenes from Passau’s colourful history. 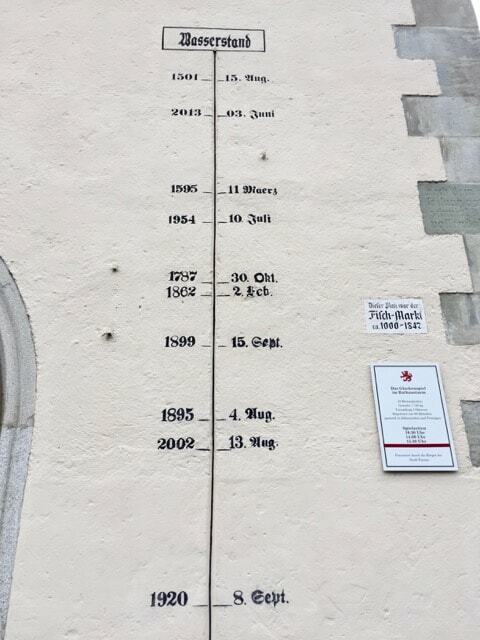 On the street-level façade, check out the flood level markers (which show flood levels in the town over the past 400 years). 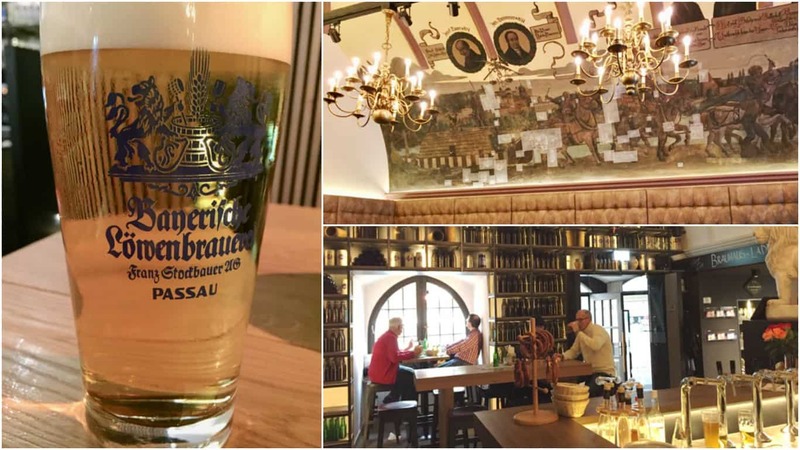 On more tip: drop by at the Löwen Brauhaus (brewery) next door for some typical Bavarian beers and food. Löwen Brauhaus in Passau is next door to the Old Town Hall. Opposite the Altes Rathaus, you’ll find the Glass Museum inside the Hotel Wilder Mann. This museum houses the world’s largest collection of European glass works: over 30,000 exhibits in styles ranging from baroque, Rococo, Empire, Biedermeier, historicism, art nouveau and art deco right up to modern art. For more art and a lovely walk through a charming alley, stroll along the Höllgasse which starts at the entrance of the Glass Museum. A colourful line leads you past many art studios and galleries. 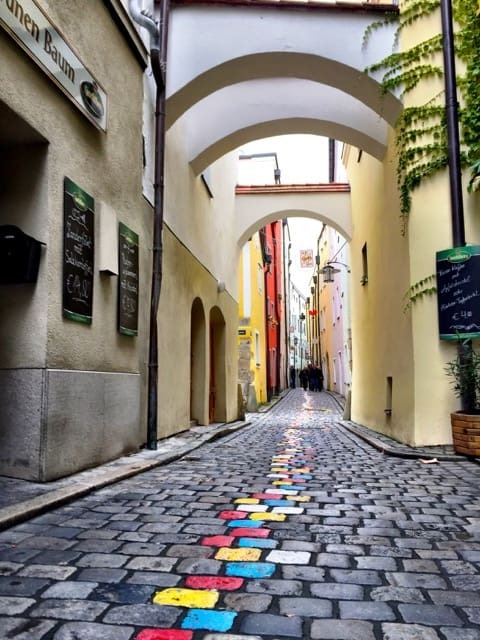 Follow the colourful line in the Höllgasse! 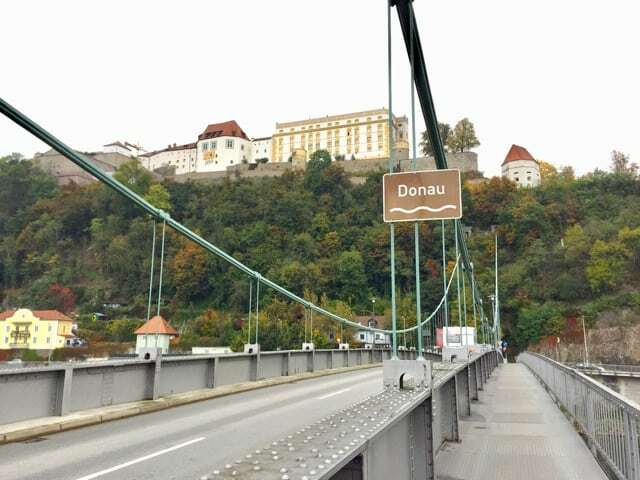 I visited Passau as part of a Danube River cruise from Budapest to Nuremberg with Viking Cruises. Read more about other cities visited along the way such as Budapest and Vienna. Search for hotels in Passau. Hi! Thanks for the article! The city looks absolutely gorgeous. I will definitely try to include it in my next trip to Europe (next year I hope!). I checked out your article on the cruise, I really like that idea, looks like a wonderful experience. Sounds like a good place for a day trip!